The full trash icon looks so much like a bust of an ancient greek philosopher. He looks evil and it is distressing. I think its the monobrow effect going on that causes the evilness. Please fix this. It is a show stopper for me. We'll need a screen-shot to help us properly test this. We'll need to grab a photo of this rubbage philosoph, please. As my friend once said, "Unless you got an 8 by 10 glossy, you ain't proved nothing"
I have attached a screenshot of said philosopher, with an image of Pythagoras alongside so you can see for your very eyes the amazing resemblance. Now bear with me for a second, but I will have you know my dear comrades, that I have uncovered a major security bug in Ubuntu. This screenshot is clear and irrefutable evidence that there is among the Ubuntu development team, a secret Pythagorean sect!! I have attached within this screenshot another image that shows the monitor preferences menu icon, and lo and behold, a RIGHT ANGLE TRIANGLE! I am sure if we were to dig deeper there would be even more Neopythagorean elements in this product created by these masterminds. What does this mean? It means irrational numbers are not safe! Do you want your children living in a world where we can not use the square root of 2?? or pi??! This madness must stop! Oh yes, I do agree with you. I was not aware of this secret Pythagorean sect... did you notice something similar with any other of the icons on the desktops? I'm pretty sure there's more signs on it!. Looks more like Mr Gumby to me. I notice you're running Lucid (Ubuntu 10.04). Could I suggest you try a newer release (the latest stable is 11.04) and see whether the trash can icon has changed and is less bothersome to look at? You can boot the Live CD and look at the icons before deciding if you might want to upgrade. 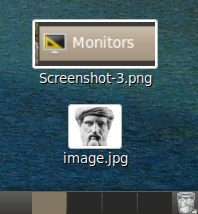 Sadly, however, the Monitors icon still shows a right-angle triangle... if that's a showstopper bug, we'll have to warn the pythagorean sect to be more inconspicuous, er, ask the designers to maybe consider changing that icon.